Thank you so much to all who auditioned this week! Simply put it was amazing to see all of the talent that the Loft Stage has! Please know that casting is one of the hardest parts of the process for me as a director. Especially since I can only have twelve folks in the cast. I encourage anyone who was not cast to join us on Friday for the tech meeting. 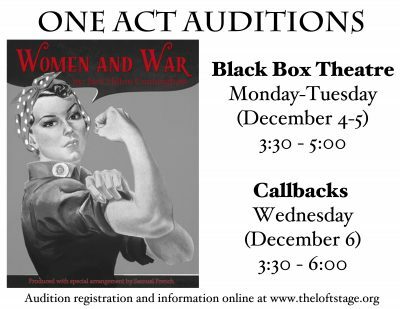 If you are cast we start tomorrow at 3:30 in the black box! No need to prepare anything in advance. Before auditioning, please take a moment to fill out the online registration form HERE. Students will be asked to perform a monologue at auditions. Actors do not have to be confined to the monologues chosen or even the script. If they have another monologue they would like to show us that is fine. Memorization is not required. Audition monologues can be found HERE. Students may peruse the entire play script HERE. Please e-mail director Leah Jensen (ljensen@theloftstage.org) with any one act questions. 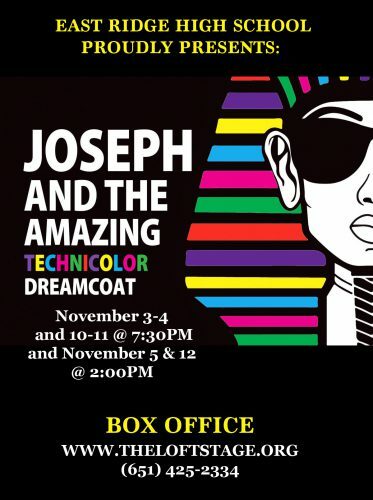 Tickets for Joseph and the Amazing Technicolor Dreamcoat are now on sale! Our new online system, Vendini, allows patrons to select a seat of their choosing and tickets may even be redeemed from a cellphone through the partner application, Walletini. Tickets may also be printed from or picked up at will call the evening of the show. Please email Jeriann Jones, at jjones@theloftstage.org, with all ticketing questions. Thank you so much for your enthusiasm about the East Ridge theatre program! We aim to give students a top-notch theatre education and none of that would be possible without you! Registration: all participants of the musical will need to register through the activities office FeePay system. The registration fee is $65 and must be paid by September 29th. While registering, please also do the same for LoftPAC, our drama club. There is no fee associated but enrollment allows admin/district a clear picture of participation and can dictate future staffing/funding. T-shirts: pay attention to the Loft Stage website for upcoming Joseph t-shirt orders. Important dates: Please review the slideshow for a list of important/mandatory dates! The presentation shown at tonight’s meeting can be found HERE. Feel free to reach out to myself, any members of the production team, and/or booster leaders with any questions as they arise – we are all in this together!